THE HASHTAG FOR GRAND PRIX WARSAW IS #GPWARSAW. JOIN THE CONVERSATION. 1,246 players entered the tournament, 385 qualified for the second day, eight sat down for the playoffs, and at the very end just one was left to hoist the trophy and claim the title: Congratulations to Jean-Emmanuel Depraz, champion of Grand Prix Warsaw 2017! The weekend showed that there still were areas left to explore in this Standard format, resources still untapped. Early on Day 1, a White-Black Tokens deck rocked the top tables and even went off in spectacular fashion with Anointed Procession/Ruthless Knave/Marionette Master on camera … before hitting a rough stretch and missing Day 2. Meanwhile, Sultai Reanimator entered the second day undefeated … but picked up a number of defeats soon enough. Blue-Black God-Pharaoh's Gift, however, kept winning … until it missed Top 8 on tiebreakers. Not to worry, though, as 2008 Worlds semifinalist Hannes Kerem piloted his Green-Blue Electrostatic Pummeler straight into the playoffs … where he immediately lost to Sultai Energy. In fact, by the semifinals, Sultai Energy, Temur Energy, and Four-Color Energy were left alone to duke it out among themselves. 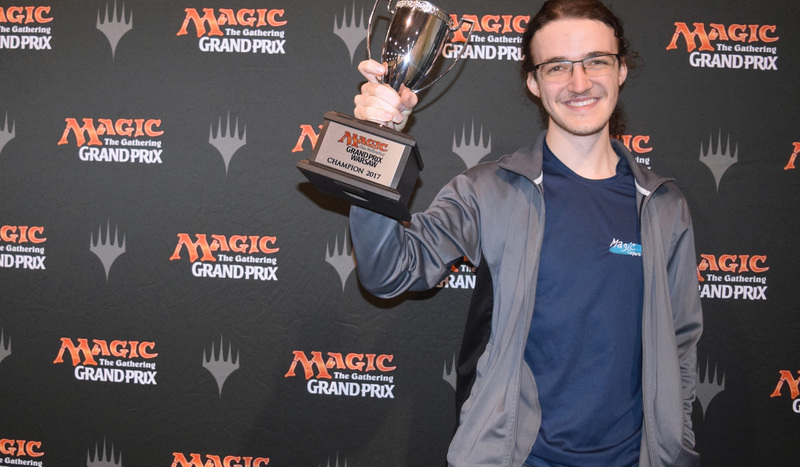 Gold pro Grzegorz Kowalski had reached the Top 8 with the latter, and cited Four-Color Energy's great matchup against the other energy decks as one of the main reasons to play it. But it was Jean-Emmanuel Depraz who turned that theory into practice. Amidst celebrations of Polish Independence Day, 1,246 Standard players gathered in Warsaw this Saturday to seek relics and to take hostages, to shock and to abrade, to harness lightning or to strike with it, to wind some constrictors and to worship The Scarab God. After nine rounds, four of them still sported an unblemished record of 9-0. Temur Energy players Pol Pizarro and Samuel Vuillot, champion of GP Utrecht earlier this year, Hannes Kerem, who already had two GP Top 8s on his record and was playing Green-Blue Electrostatic Pummeler, and Russia's Alexander Privalov piloting Mardu Vehicles. The pros, fresh back from the previous week's Pro Tour Ixalan in Albuquerque, mostly stuck with the established decks. Of the thirteen Gold and Platinum players, a full nine chose to run some Temur-based energy strategy, most with little to no black, some with quite a bit. We still got to see a number of new developments in the feature match area however. Apart from the aforementioned Pummeler deck, Green-White Aggro popped up again and again, one Sultai Reanimator earned a 11-0-1 record between Friday's Trial and Saturday's main-event rounds, and White-Black Tokens actually delivered a proper combo kill, drawing an unlimited number of cards with Ruthless Knave before ending the game with Marionette Master! Tune back in tomorrow for more Standard news and Standard action, for decklists and expert commentary, for the homestretch and the epic conclusion of Grand Prix Warsaw 2017!